Source: "Illinois, Chicago, Catholic Church Records, 1833-1925," Baptism Records for Holy Rosary Catholic Church, Family Search (www.familysearch.org : accessed 19 January 2012), Baptismal record for Howard James Corcoran on page 31 in Book of Baptisms 1905-1915; image 22 of 134. The Chicago Illinois Catholic Church Records are not indexed on Family Search and I had to go page by page to find the baptismal record of Kirk's great uncle, Howard James Corcoran. It was kind of a hunt and peck method for awhile. I was going on faith that Howard was baptized in the same church that his parents were married in and I got lucky! It helped that I had Howard's birth date, 9 February 1907. The record above is for Howard James Corcoran, born Feb 9, 1907. Father is Timothy Corcoran and Ellen Smith (actually, it is Helen Schmitt, but she went by Smith for some reason.). Sponsors are Bertram Venard and Agnes Venard. Howard was baptized on Feb 24th 1907. Signed by E. S. Keough. 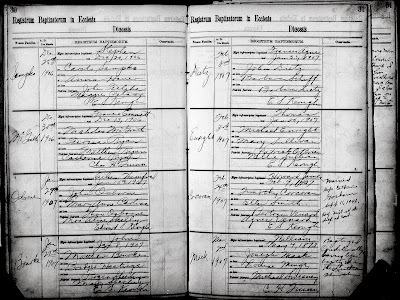 In the margin of the baptismal record is a note that says "married Hope Catherine Gorham Sept 11, 1943" with words I am assuming is in Latin and I cannot read. I love that the marriage record was recorded with the baptismal record. I wonder if that was common to do in the Catholic records. It is the first one I have seen that did it. 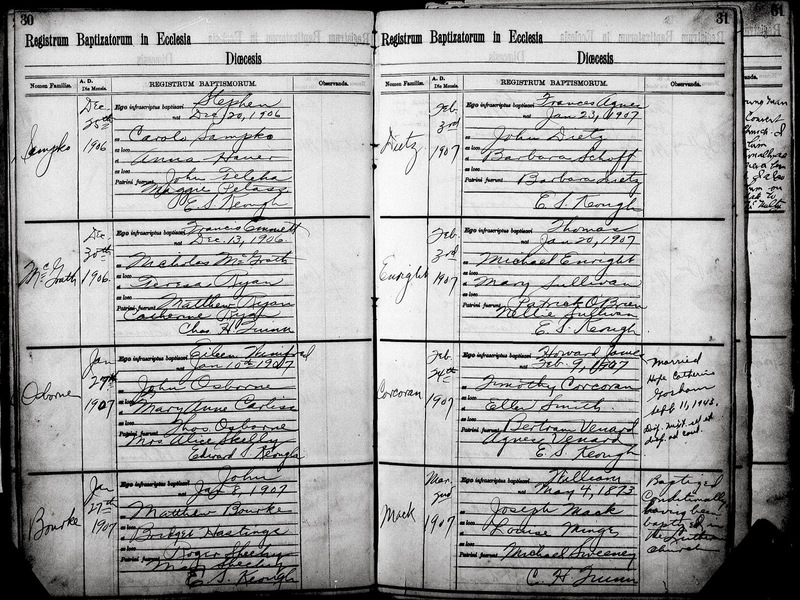 More research is needed on Bertam and Agnes Venard, were they relatives? In addition to providing me with Howard's baptismal record, it helps me to narrow down when Timothy and Helen Corcoran moved to Michigan. It is amazing when you go looking for one record and it opens up other avenues of research. That is what this baptismal record did for me.